On a more politically serious (and dangerous) note, O’Rourke’s jocular comment (which he repeated before walking it back) that his wife was basically raising their three kids while he ran for president spurred plenty of hostile discussion of the benefit he derived from being male. Multiply all this criticism by the frequency at which he was raked over the coals by Republicans and supporters of Democratic rivals, and ratchet it up a few notches via repetition on Twitter, and you have a bit of a mess for a new candidate who had previously ascended on a wave of viral adulation just as intense as this apparent downward swoon. Beto O’Rourke raised $6.1 million in his first 24 hours as a presidential candidate, according to his campaign, surpassing Bernie Sanders and every other 2020 Democrat who has disclosed their figures. O’Rourke’s campaign announced Monday that he had taken in $6,136,763 in online contributions in the day after declaring his candidacy Thursday morning. That’s right: Beto topped the $5.9 million in initial fundraising by Sanders that so overwhelmingly wowed the political world and solidified the story line that Bernie was the 2020 front-runner. On one level this should not have been surprising. After all, O’Rourke’s phenomenal viral fundraising machine (producing a record $70 million haul without PAC dollars) is precisely why he gained so much national attention during his impressive if ultimately unsuccessful 2018 race against Ted Cruz. Across a breathtaking succession of stops throughout Iowa, from three different countertops, one podcast studio, and one truck bed, the first three days of O’Rourke’s campaign unfolded a world away. It wasn’t that Iowans hadn’t seen the skepticism about O’Rourke. It was that many of them didn’t much care. 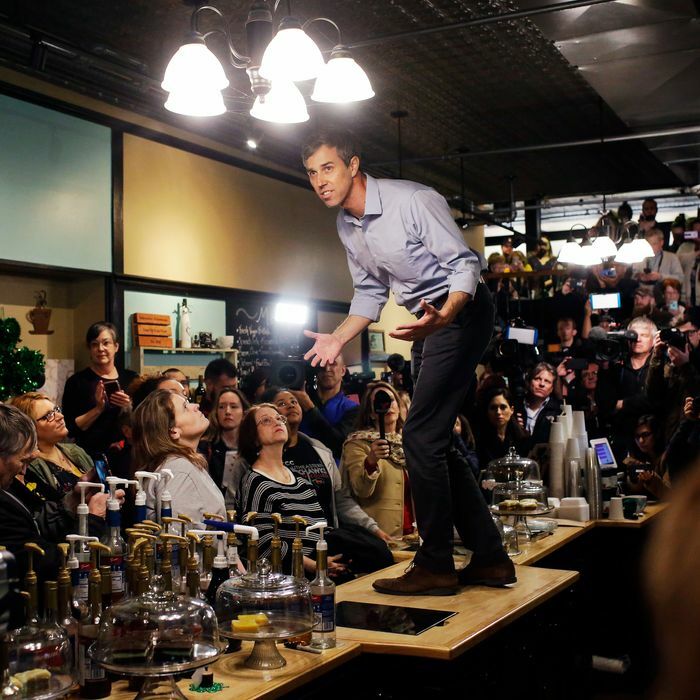 They saw an O’Rourke much closer to the one who stormed across Texas, coming within a narrow margin of defeating Cruz. We’ll soon know from polling numbers whether the Beto Backlash damaged his standing as a candidate or if instead, like most of his rivals, O’Rourke got a bounce from all the attention. But you could forgive him for experiencing some dizziness from the wild swings in the tone of coverage he’s getting.